SIMPLY REPLACE THE EXISTING TOP STRUT MOUNTS : Steel with elastomer bushed centers and “captive” ball race thrust bearings for day to day commuter usage. Simply replace the existing top strut mounts (no modifications). Reinforcing the strut towers and with the unique K-MAC patented design providing the biggest (and quickest) adjustment range of both Camber and Caster. 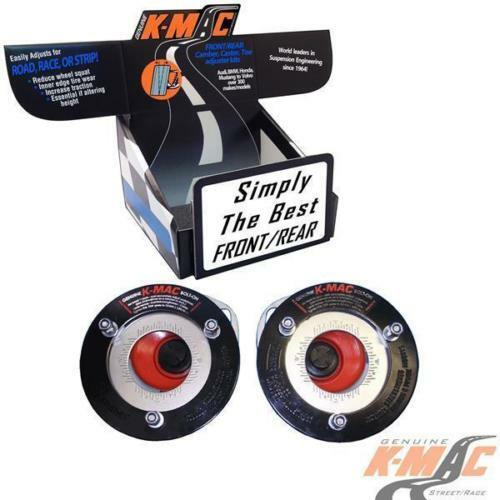 Another K-MAC Patented design feature allows this fast adjustment to be made accurately under load. FEATURES / ADJUSTMENT RANGE : The strut towers and with the unique K-MAC patented design providing the biggest ( and quickest) adjustment range of both Camber and Caster. Street / Race setting can be recorded and changed in 30 sections – just the time taken to loosen the 3 top mount nuts. 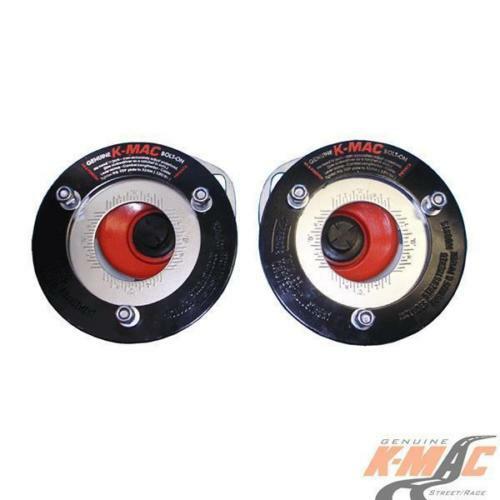 Another K-MAC Patented design feature allows this fast adjustment to be made accurately under load.